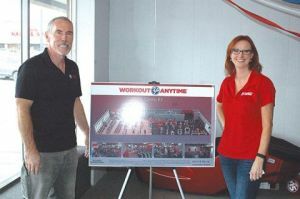 Corbin Workout Anytime franchise owners Doug Ladd and Caroline Hendy showed plans for the facility, which will be located in the Forest Hills Shopping Center on Cumberland Falls Hwy. In a day and time where people are constantly on the go, finding the 30 to 45 minutes to squeeze in a workout is becoming more and more difficult, especially when it involves a trip to the gym. Doug Ladd and Caroline Hendy are seeking to expand that window to workout to anytime by opening a new Workout Anytime location in Corbin. “We wanted to do something and start up something together and help people,” Hendy said. Ladd said he had been a member of the club in the Knoxville, Tennessee area and has been impressed with what it offers. “It has everything you need has a great atmosphere and the price is right,” Ladd said. “They just have a great system that is very simple,” Ladd added. The new location, currently under construction in the Forest Hills Shopping Center on Cumberland Falls Hwy. Hendy said memberships start at $15 per month, which not only gives access to the Corbin location, but to any of the 150 Workout Anytime locations across the country. The facility will feature a variety of cardio equipment including treadmills ellipticals, stair climbers and stationary bikes, weight machines and free weights. Ladd said he knows from personal experience the positive impact even small changes in a person’s diet and exercise routine can have. Ladd said for someone who has never been to a gym or has not been in a gym in years, the staff at Workout Anytime will be ready and willing to help get them setup with a simple workout routine to meet their goals. Ladd and Hendy said whether a person wants to walk on a treadmill to help lose weight or pump heavy iron to pack on muscle, the goal of Workout Anytime is to give the person the opportunity to make that happen. The facility will have staff on hand between 8 a.m. and 8 p.m. Members will have keycards to allow access beyond that. The goal is to have the facility up and running by September 15. Additional information and memberships may be obtained in the space next door between noon and 8 p.m. Monday through Saturday and noon until 5 p.m. on Sunday. Online, individuals may go to www.workoutanytime.com/corbin or on Facebook at Workout Anytime Corbin. The $49 enrollment fee has currently been reduced to $1 for the Corbin facility. “We want to take away any excuse someone has for not working out and becoming healthier,” Ladd said.